BANFF, ALBERTA, Canada – At Snowy Owl Dog Sled Tours, we know the importance of team work. Our Team Enhancement Dog Sled Tour in Banff National Park teaches leadership, commitment and cooperation to all kinds of groups and offers an unforgettable experience in the most beautiful region of the Canadian Rockies. Our innovative dog sled tours in Banff National Park foster camaraderie between participants and the noble huskies leading their sleds. Those who participate in our program return to their daily lives with a renewed sense of community and determination. Groups take on the challenge together and emerge stronger and more united. All custom group team building tours teach participants to work together rather than against one another. Each tour features an inspirational speech by Snowy Owl Dog Sled Tours owner Connie Arsenault, who has lead our pack for over 28 years. Connie also co-founded the Alberta International Sled Dog Classic and was western regional director of the International Sled Dog Racing Association. We offer introductory or half-day sled trips, with options to extend the journey and customize according to your preferences and goals. Please call us for pricing and availability! 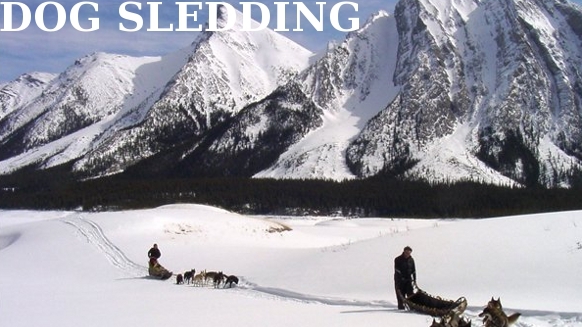 Give the gift of an authentic Canadian dog sled tour to your friends or loved ones. Inquire about our Snowy Owl Sled Dog Tour gift certificates. Hey! Want to know what the weather is like in Banff, Canmore and Jasper? Check out our live, user-controlled 360° webcams at Rockies.com! Watch this Snowy Owl Dog Sledding video and get ready for some winter fun! At Snowy Owl Dog Sled Tours, we understand the importance of safety. Temperatures can hit below freezing in Banff National Park, with high winds and unpredictable weather conditions. It’s extremely important that you dress warmly and follow our recommendations for what to where on your Canadian Rockies dog sledding tour. Check out our Snowy Owl What To Wear resource page, where we talk about the different clothing fabrics and the dos and don’ts of winter dress.